First off, I feel the need to emphatically state that nobody wants a strong, vibrant book business more than me. I am a self-declared cheerleader for this industry. But it seems the right time to put my pom poms aside for a while to make a more cautionary point. Let’s call a spade a spade. Five years ago publishers had no idea that ebooks would stall or that bookshops would bounce back. Let’s not forget the many predictions that print was dead – not to mention bookshops – and that we were heading for digital obliteration. I had many a conversation with industry folk who said they thought Waterstones would last only a couple more years. Instead, I would argue that this is exactly the time we should be building our own future, aggressively. Creating platforms that give us more ownership of the publishing & bookselling ecosystems. Building businesses which create new revenue streams. The good news is that there are plenty of innovative models to draw inspiration from if we’re commited to forging ahead. Wattpad – an online community for writers to post chapters of books, fan fic, poetry and reach engaged readers for feedback – launched in 2006 and now has 45 million users and 300 million stories uploaded. Lost My Name – the platform for personalised picture books for kids – launched in 2012, has sold more than 2.6 million picture books, and has just signed a deal with Roald Dahl estate. Scribd.com – a book subscroption service – says it has over 500,000 subscribers paying $8.99/month for ebooks, audiobooks, and now news. NetGalley – a blogger and influencer network offering publishers a seamless book review process pre-publication – has grown since 2012 to reach 360,000 members worldwide. What were you doing when Wattpad launched 11 years ago? 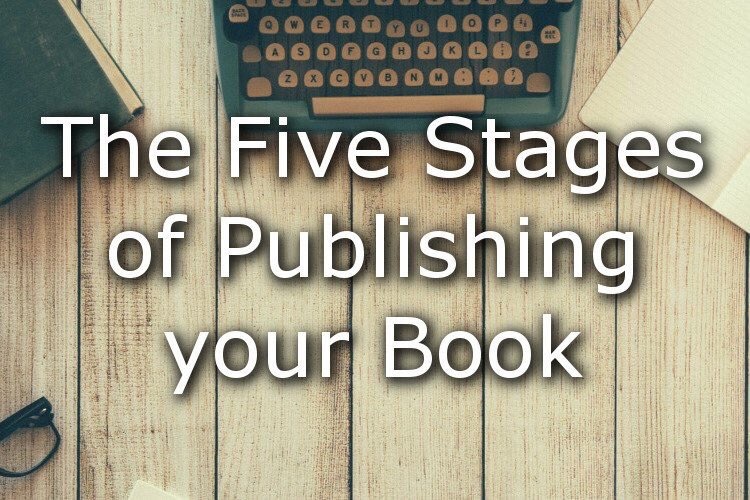 There are many other companies I could have chosen, but these five all offer value and service at different stages of the publishing ecosystem. And all of the founders came from outside of the industry. There’s plenty to learn, too, from companies that have diversified away from their core businesses to build new revenue streams. Conde Nast, the magazine publisher behind Vogue, now runs its own fashion & design collegeoffering degrees and courses, and has also recently launched a fashion ecommerce site. Sawday’s has transitioned from a travel guide publisher to a luxury travel company (that sells books). Marie Claire, the magazine published by Time Inc, now has its own cosmetics ecommerce platform and a physical shop in London. And Johnson’s Baby products launched a website called BabyCenter in the US nearly 20 years ago offering advice through pregnancy. This has grown to become a comprehensive resource for parents and now has 45 million global monthly unique visitors and generates huge amounts of advertising revenue. Of course, the site also provides Johnson’s with real-time audience behaviour data and a huge email database to sell to as well. It’s interesting to note that all of the consumer-facing businesses above launched with new names and did not rely on their existing brands – we don’t have Johnson’s For Babies or the Marie Claire beauty shop. They displayed the confidence to build new brands even when they already have exceptional traction and recognition with the old ones – a bold step that was central to their success. So, are book publishers in a position to diversify in such a way? I simply refuse to believe that they can’t do so, while also maintaining their core proposition: to publish sensational books and nurture authors’ careers. And I genuinely believe we must, if we want to survive long-term. We need to get ahead of the next phase of disruption by disrupting ourselves and innovating with vision and commitment. This is not the time to sit back and hope the status quo will last. We might not weather the next wave with such good fortune. 1. The number of books being published every year has exploded. According to the Bowker Report (September 7, 2016), more than 700,000 books were self-published in the U.S. in 2015, which is an incredible increase of 375% since 2010. And the number of traditionally published books had climbed to over 300,000 by 2013 according to Bowker figures (August 5, 2014). The net effect is that the number of new books published each year in the U.S. has exploded by more than 600,000 since 2007, to well over 1 million annually. At the same time, more than 13 million previously published books are still available through many sources. Unfortunately, the marketplace is not able to absorb all these books and is hugely oversaturated. 2. Book industry sales are stagnant, despite the explosion of books published. U.S. publishing industry sales peaked in 2007 and have either fallen or been flat in subsequent years, according to reports of the Association of American Publishers (AAP). Similarly, despite a 2.5% increase in 2015, U.S. bookstore sales are down 37% from their peak in 2007, according to the Census Bureau (Publishers Weekly, February 26, 2016). 3. Despite the growth of e-book sales, overall book sales are still shrinking. After skyrocketing from 2008 to 2012, e-book sales leveled off in 2013 and have fallen more than 10% since then, according to the AAP StatShot Annual 2015. Unfortunately, the decline of print sales outpaced the growth of e-book sales, even from 2008 to 2012. The total book publishing pie is not growing – the peak sales year was in 2007 – yet it is being divided among ever more hundreds of thousands of print and digital books. 4. Average book sales are shockingly small, and falling fast. Combine the explosion of books published with the declining total sales and you get shrinking sales of each new title. According to BookScan – which tracks most bookstore, online, and other retail sales of books (including Amazon.com) – only 256 million print copies were sold in 2013 in the U.S. in all adult nonfiction categories combined (Publishers Weekly, January 1, 2016). The average U.S. nonfiction book is now selling less than 250 copies per year and less than 2,000 copies over its lifetime. 5. A book has less than a 1% chance of being stocked in an average bookstore. For every available bookstore shelf space, there are 100 to 1,000 or more titles competing for that shelf space. For example, the number of business titles stocked ranges from less than 100 (smaller bookstores) to up to 1,500 (superstores). Yet there are several hundred thousand business books in print that are fighting for that limited shelf space. 6. It is getting harder and harder every year to sell books. Many book categories have become entirely saturated, with a surplus of books on every topic. It is increasingly difficult to make any book stand out. Each book is competing with more than thirteen million other books available for sale, while other media are claiming more and more of people’s time. Result: investing the same amount today to market a book as was invested a few years ago will yield a far smaller sales return today. 7. Most books today are selling only to the authors’ and publishers’ communities. Everyone in the potential audiences for a book already knows of hundreds of interesting and useful books to read but has little time to read any. Therefore people are reading only books that their communities make important or even mandatory to read. There is no general audience for most nonfiction books, and chasing after such a mirage is usually far less effective than connecting with one’s communities. 8. Most book marketing today is done by authors, not by publishers. Publishers have managed to stay afloat in this worsening marketplace only by shifting more and more marketing responsibility to authors, to cut costs and prop up sales. In recognition of this reality, most book proposals from experienced authors now have an extensive (usually many pages) section on the authors’ marketing platform and what the authors will do to publicise and market the books. Publishers still fulfill important roles in helping craft books to succeed and making books available in sales channels, but whether the books move in those channels depends primarily on the authors. 9. No other industry has so many new product introductions. Every new book is a new product, needing to be acquired, developed, reworked, designed, produced, named, manufactured, packaged, priced, introduced, marketed, warehoused, and sold. Yet the average new book generates only $50,000 to $150,000 in sales, which needs to cover all of these new product introduction expenses, leaving only small amounts available for each area of expense. This more than anything limits how much publishers can invest in any one new book and in its marketing campaign. 10. The book publishing world is in a never-ending state of turmoil. The thin margins in the industry, high complexities of the business, intense competition, churning of new technologies, and rapid growth of other media lead to constant turmoil in bookselling and publishing (such as the disappearance over the past decade of over 500 independent bookstores and the Borders bookstore chain). Translation: expect even more changes and challenges in coming months and years. There can be many reasons why a book fails to grab readers, and while this post concentrates mostly on the technical aspects and marketing side of publishing rather than the actual writing process, the choice of book genre can have major implications on both writing and marketing. Writers often start writing a novel without giving their end product much thought, so when finished, it may sometimes be difficult to find a precise category or book genre for the book when it comes time to publish. Often begins with the crime as the inciting incident (murder, theft, etc. ), and the plot involves the protagonist uncovering the party responsible by the end. The crime has already happened and thus your goal in plotting is to drive toward the Big Boss Battle, the unveiling of the real culprit. Generally involves trying to stop some bad thing from happening at the end. Thrillers have broad consequences if the protagonist fails i.e. the terrorists will launch a nuclear weapon and destroy Washington D.C. Suspense novels have smaller/more intimate consequences. i.e. The serial killer will keep butchering young blonde co-eds. It is easy to see how thriller, suspense and mystery are kissing cousins and keep company. The key here is that there is a ticking clock and some disastrous event will happen if the protagonist fails. Guy and girl have to end up together in the end is the only point I will make on this. Romance is all about making the reader believe that love is good and grand and still exists in this crazy world. The hero cannot be your Big Boss Trouble Maker. Yes, the guy will likely be a scene antagonist, but that is different. Romance, however, is very complex and I cannot do it justice in this short blurb. If you desire to write romance, I highly recommend you go to the Romance Writers of America site for more information. This is one of the most amazing writing organizations around and a great investment in a successful romance-writing career. Is character driven. The importance is placed on the inner change, and the plot is the mechanism for driving that change. Literary fiction has more emphasis on prose, symbol and motif. The events that happen must drive an inner transformation. Pulitzer Prize-winning book, The Road is a good example. The world has been destroyed and only a few humans have survived. The question isn’t whether the man and the boy will survive as much as it is about how they will survive. Will they endure with their humanity in tact? Or will they resort to being animals? Thus, the goal in The Road is less about boy and man completing their journey to the ocean, and more about how they make it. Can they carry the torch of humanity? For instance, in Joy Luck Club, June’s impending trip to China is what brings the women together and what forces each of them to change the patterns of the past. The trip is irrelevant save for two purposes: 1) bringing the women together to face their demons and 2) when June actually makes the trip to China to meet her mother’s twin sisters (the lost babies) we know the change has occurred and the chains of the past have been loosed. Will involve some degree of world-building and extraordinary events, creatures, locations. In plotting, world-building is an essential additional step. How much world-building is necessary will depend on what sub-class of fantasy or sci-fi you’re writing. Word count will also be affected. The more world-building, the longer your book will be. Some books, especially in high-fantasy can run as long as 150,000 words and are often serialised. This is another genre that breaks down into many sub-classifications and runs the gambit. It can be as simple as a basic Monster in the House story where the protagonist’s main goal is SERE-Survive Evade, Rescue, and Escape. The protagonist has only one goal: survive. These books tend to be on the shorter side, roughly 60,000 words. I won’t talk long about YA, since YA beaks into so many subcategories. Often YA will follow the rules of the parent genre (i.e. YA thrillers still have a ticking clock, fast pacing and high stakes just like regular thrillers). The differences, however, is that YA generally will have a younger protagonist (most often a teenager) and will address special challenges particular to a younger age group. So there you have it. 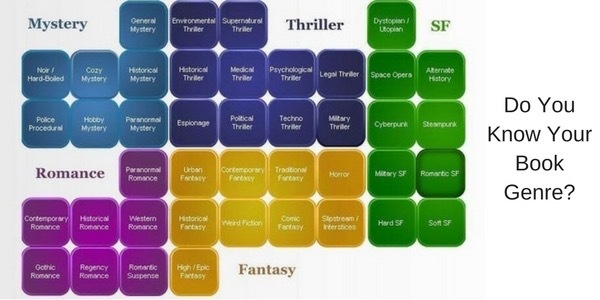 A quick guide to book genre’s, which I hope has made things a little clearer for you. Picking a genre is actually quite liberating. Each genre has unique guideposts and expectations, and, once you gain a clear view of these, then plotting becomes far easier and much faster. You will understand the critical elements that must be in place – ticking clock, inner arc, world-building – before you begin. This will save loads of time not only in writing, but in revision. I hope you found it useful.